[We Say] We Are The Champions! Sports played a huge role in the life of West Terre Haute from 1900 to the 1930s. In addition to school and church teams there were many adult amateur and semi-pro teams in many sports. At any one time 4-6 amateur or semi-pro baseball teams represented the town (often with my grandfather and his brothers playing on several teams during a season). With the end of the baseball season football took over. There were the Tigers, a semi-pro football team that played in a regional league. Over the years there were several different soccer (called association football) teams that played in leagues. The soccer teams were a natural outgrowth of the large Welsh and English population of the town’s love for the sport. There was even a tri-county horseshoe league in which West Terre Haute was represented. Polo, believe it or not, was played in the area. 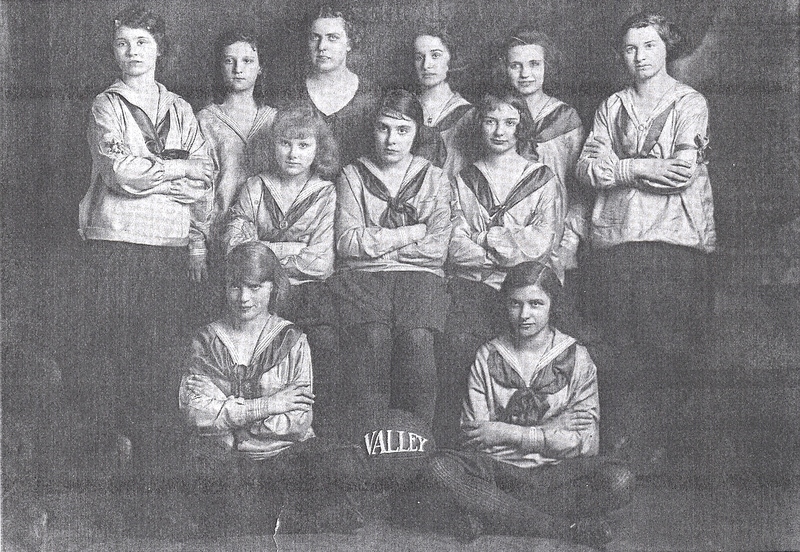 But the most successful – and controversial- team was the girls’ basketball teams at West Terre Haute (Valley) High School from 1921 to 1923. They were talented. They were tough. They were well coached. They were undefeated. And, some said, they were unsportsmanlike at best, cheaters at worst. Some claimed they were aided by referees so biased as to not be believed. Indeed, some teams believed they were “Van Winkled” by a certain referee they claimed was fiercely partisan for the WTH team. It may surprise some, but girls’ basketball was a very popular sport in the 1920s. And it was all but unregulated. (Indiana did not have a sanctioned girls’ state championship until 1976.) There were few hard and fast rules governing games prior to WWII. High school teams would play college teams, town teams, church teams, whomever they could get games with. There were loose associations that tried to formalize rules in their area, but there were no overall uniform, governing bodies or regulations. The Valley High girls appeared to have played both types of games, though primarily five-girl basketball. And they played them well. The 1921-1922 and 1922-1923 teams were undefeated over more than twenty games`. They were coached by an aggressive Indiana State Normal (now ISU) alum and basketball star named Carrie Surrell, who credited her team’s success to hard work and “teamwork.” They played teams from all over the region, including Terre Haute teams, Clinton, Rockville, Petersburg, Concannon, etc. Among their most bitter rivals was the Sullivan High School team. The enmity began in February, 1922. The Valley girls beat Sullivan twice, but acrimony followed. A February 25, 1922 Sullivan Daily Times article following Sullivan’s second loss to West Terre Haute opined that “The Sullivan girls played a clean game, but at no time did they have a chance to win as the game belonged to West Terre haute before the whistle ever blew for the start.” This was because again the referee was a Miss Van Winkle who the paper claimed was outrageously partial to the Valley team. It noted that the other referee, a Miss Pigg from Terre Haute, called a fair clean game assessing four fouls on Sullivan and five on WTH. Miss Van Winkle, on the other hand, called 18 on Sullivan and none on Valley. It was not just Sullivan. A 1922 game scheduled between Valley and Terre Haute Wiley had to be cancelled when the two teams could not agree upon referees for the game. Was this all “losers weepers” talk? Some of it may have been. Obviously in a few cases it seems Valley might have had a sympathetic referee on the floor with them, but in an age when teams had a voice in who would referee their game on imagines every other team might be looking for an edge. Clearly, the Valley girls’ team was talented and well coached. Some of the criticism of them may have come from the fact that West Terre Haute was often looked down upon and others could not accept their team was beaten by the “river rats” from West T. A check of the roster (see below) shows that 7 of the 10 players were from working class homes and they likely displayed a toughness that other teams did not. That they were a great team for the era is clear. They first presented their claim to the state championship in February 1923. Coach Surrell noted her team had won 19 straight games over a wide variety of opponents. She pointed out that the team had outscored the opposition 522 to 231 during the streak. That average of over 27 points per game was exceptional in that low scoring era. Again they offered to take on all comers. We wonder why you have never answered the challenge we sent to you some weeks ago. Was the challenge accepted? It seems not. I checked both Terre Haute papers and found no further reference to a game (tho it must be noted that several articles were cut out of the sports section that may have detailed the game). In the end, were the Valley girls’ state champions? Two other teams initially challenged that claim. One was Sullivan, who by beating the Robinson, Illinois team in a Wabash Valley tournament, said the honor was theirs. But soon after they lost those two bitter games to Valley. The Dugger, Indiana girls team believed they deserved the honor, noting they were undefeated and one of their opponents was a college team. In the end, though, it seems that the Valley High team was accepted as the state champs. And so they remain a source of pride to those dwindling few who remember them. West Terre Haute was home to champions for that bright, shining moment. Munich, where fear and cowardice chose to mask itself in classic English tones and pitiable self-delusion against brutal, mocking truth. Dien Bien Phu, where for the first time Western arrogance saw its coursing red blood drawn by the bite of their inferiors. Dallas, where each shot from that Mannlicher-Carcano, guided by the self-aggrandized, nictating eye, laid mortal a thousand truths and homilies. Some places are of no great importance for a wider world and belong only to a few. Named after one of West Terre Haute’s early merchants, McIlroy Avenue (pronounced Mac uh roy), only runs about 6 or 7 blocks south from Paris Avenue. The blocks between National and Paris Avenue were our route, mine and Gramps’. “Let’s take a walk, Buck (his nickname for me),” he would say. And off we would go. Gramps usually carried a stick (likely the handle of one of Grandma’s old brooms) because he was frightened of dogs and would wave it at them if he thought they were coming too close. Among our favorite family stories was the time Gramps was asked to bring home a big bag of potato chips for a family gathering. When he got home and the bag was hungrily ripped open an aunt found the it contained only crumbs. A dog had lunged at Gramps and he fought him off with the potato chip bag. Not a chip remained unbroken when the duel was over. More often than not our destination was Snacks Café. Snacks tavern is an institution, having weathered the Prohibition era, when it was renamed a “soft drink parlor” (nudge, wink). It still stands, barely, serving its dwindling clientele. I would wait in the back room while he went through the swinging door where Gramps got two quarts of beer. Falstaff and Sterling were his favorite, possibly because they were cheapest, fifty cents a bottle if I remember correctly. While he ordered and perhaps chatted with the bartender I would wait in the back room. An occasional raucous laugh floated toward me through the swinging door. But I remember the smells most of all. That ever pervading scent of stale beer and cigarettes mingling with fried onions and hamburgers is fixed deeply in my senses. Every time I pass an old tavern with its exhaust fans wafting that smell into the street (it happens a lot in Chicago, for some reason) I am instantly back again at Snacks Café. When Gramps was done, his brown paper bag filled with beer, we walked back home, just talking. But my stretch of McIlroy was the block between National and Riggy. No Black ever walked it. Nor any Jew as far as I know, unless it was earlier in the century and he was a salesman. A gay man walked it. But he was followed by a dialogue usually spoken from behind a hand hiding a smirk. There goes the sissy. You boys never be alone with him. Still it was my street. On the southwest corner of National and McIlroy was “Red” Roach’s Gulf station. It sat on land once owned by my great grandfather David Arthur, and adjacent to parcel where another great grandfather’s family lived. The Gulf station was a place to get a bottle of pop or candy bar. Or, if you used what I thought was a strange gum machine in the men’s bathroom, condoms if you were one of my uncles. There was an empty lot south of the station. We played there occasionally. I remember one dark night when I was in my The Man From Uncle phase the field was a nest of foreign spies. I chased them with a highly prized plastic Beretta fitting snugly in a holster I fashioned from the leather price-labler holder Uncle Danny brought home from his job at the A&P. South across an alley was the telephone building and the Wardle’s house. It was a Bedford stone house and my favorite in town. I just liked its clean solid looks. Claude ran a lumbering business. Between high school and joining the Marines my uncle Jim worked for Claude. I remember him piling into the huge dinners Grandma would make, building a small mountain of mashed potatoes on his plate. Grandma sometimes cleaned for Jessie Wardle. Jessie was in her late fifties or early sixties and favored a drink or two in the afternoon I remember. I also remember her too-blonde hair and the low-cut blue dress that presented me with my memorable first view of cleavage. Across the street was 101 W. Riggy, but more on that house later. Gramps flanked by mo Mom on huis left and Aunt Eileen on left. They are standing on road in front of Riggy house. To their lift is a wisp of 20 S. property. The Dog N Suds was on the southeast corner of National and McIlroy. It was an oasis of bright lights and tempting aromas. Mom worked there for a bit after I was born. Grandma loved their fish sandwiches, which were often purchased on Fridays. It was owned by Charlie Clements, and also stood on property once owned by David Arthur. Charlie and wife June, a kindly but always tired looking woman, worked the kitchen. There often treated me to blissfully cold and foamy root beers or ice cream cones. Charlie’s legs were aided by metal crutches, the kind that included supports that came up to his elbows. I often saw him struggle to move forward. He had contracted polio. I was told by his son when I was five that his dad’s polio was caused by him swallowing a bug. For a year afterward I would frantically spit out any insect that might land in my mouth lest I spend my life in an iron lung. It was not until the second grade that we all lined up in the gymnasium at Consolidated School, jiggly waiting in line to swallow the sugar cube that would save us from being trapped in that terror-inducing machine. The Clements lived in a house behind the Dog N Suds. Their daughter Amy was my age and the first girl I became smitten with. 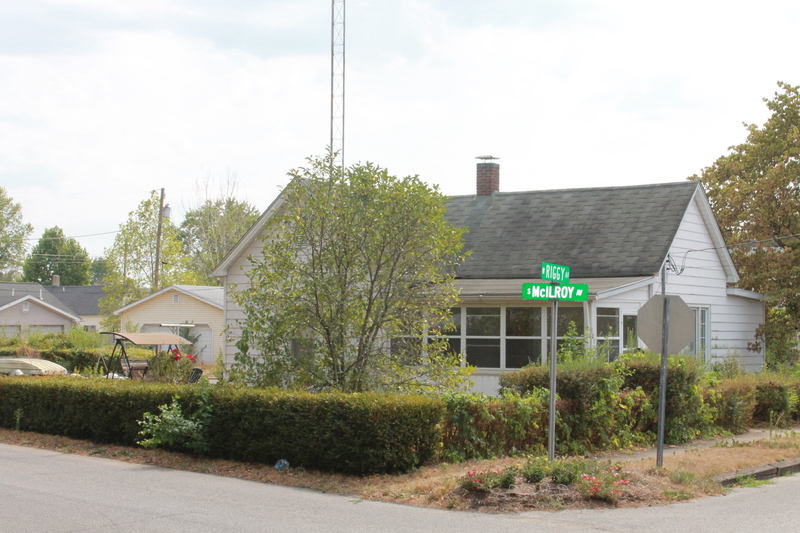 Just south of their house was a tiny home where June Clements’ mother lived. The house had a mysterious aura to me. Perhaps because Amy’s grandmother was ill, or perhaps ill-tempered, we never were invited in there. It had a closed in, dark feel to it. I usually hastened my step when walking by there. The next house on McIlroy was a two-storey brown shingled house. It was on property sold by my Grandma to the Clements. Mom and I lived in a second floor apartment there for a while after I was born. 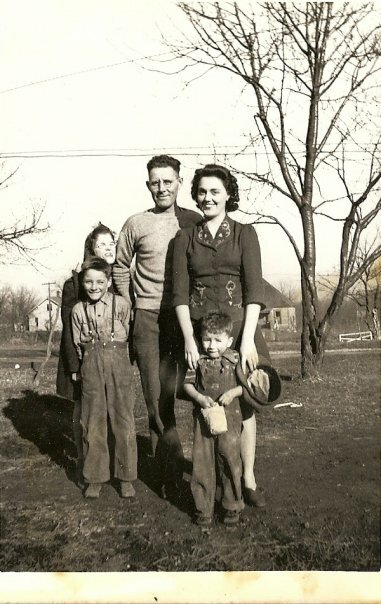 The first neighbors I remember were the Mattox family, Jerry, Rita, and their two girls. I liked Rita a lot, but Jerry, a diffident man who worked as a mechanic, seemed a distant sort. Between their house and the hill stood a small shed. Behind that shed a neighborhood girl and I gigglingly removed out pants and allowed each other to survey the disparate wonders of our nether regions. So that was the stretch that led to Grandma and Gramp’s house. The street at the center of my existence. When I was 5 or 6 Mom and Grandma would let me walk up McIlroy as far as National around 5:00. Cautioned to watch out for cars I was allowed to stand by the Dog N Suds and wait for Gramps to come home from work. This would have been in his last years working, as 10 years in the mines and 37 more working at Terre Haute Concrete Supply had overcome his lungs. He would ride the bus home and get off at Paris and McIroy and walk home. He would stride across National and take my hand and lead me home to 20 S. McIroy. I have lived in many houses. But until Robin and I bought the house we have made our home, it was truly the only place in the universe that was home to me. The house at 20 S. was perhaps the most unusual one in West Terre Haute. Not for its splendor or stately lines certainly, but because it was basement house. It was not intended to be that, but circumstances made it unable to fulfill its full stature. After they married my grandparents lived in several places, in David Arthur’s old house on National, in St. Marys, in Terre Haute. But they finally settled at 101 West Riggy, the house Grandma grew up in. They loved there for over twenty years. My Mom and all but two of her nine siblings were born or lived there on that triangular slice of land. Just before WWII they decided to build their own house. It was to be much larger. I know this because I sometimes pulled out the blue architectural drawing they kept in the cedar chest at the foot of their bedroom in the basement house. It would have been a fine home. But materials shortages caused by the war and other things forestalled their dream house. Not until after the war did they start to build on the property left to Grandma by her family. They never finished it. The why is not fully known. Perhaps because their four oldest children had already moved out to start lives of their own, or money became short. Likely it was a combination of both. They sold 101 W. Riggy and moved, leaving the home Grandma had known. Eventually it was bought by Arnold Selvia. He lived there with his family. His second wife Lois became one of our great friends. She and Grandma were close. His youngest daughter was named Susan. She was a tall girl who combined a bright smile with something forlorn living behind her eyes. At 14 she became partner of my first kiss and first love. Sadly, McIlroy and Riggy did not become the home, the safe haven, that it did to me. Shortly after high school she moved to Los Angeles, perhaps looking for that place. She died alone, in an LA County Jail cell, of a drug overdose. She was 21. The stairwell was bookcased by two rooms. One might have first been used as one of the boys’ bedrooms, but later was used for storage. The other was the coal room. About once a month the coal dealer would deliver a load from one of the mines to be shoveled down into the room. Until I was about 10 the house was heated by two potbellied stoves, one in the living room, another in the kitchen. One of my jobs was to shovel out the ashes at night and the next morning. Next came the living room and Grandma and Gramps’ bedroom. I spent my first night after coming home from my birth at St. Anthony’s Hospital in their bedroom, swaddled and placed in the drawer from their bureau because my babybed was not yet put together. The kitchen was next to the storage room. Grandma cooked on both a gas range and the coal stove. In one of the more oldey-timey, clichéd aspects of my life my early baths took place in a zinc bathtub beside the coal stove. Grandma’s Maytag wringer washer was in one corner. I was fascinated by the wringer and when I was old enough she let me work it to pull through the slopping wet clothes. Her washdays were long enough when it was just her, me and Gramps, I can’t imagine what it was like when she had seven or eight kids at home. 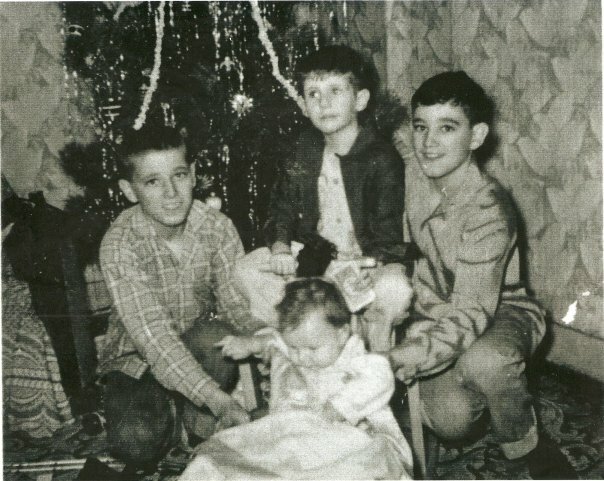 Christmas 1957 at 20S. Mcilroy. I am in middle with uncles Danny and Kenny holding my brother Terry. I will always remember that wallpaper. We were a kitchen family. That is where everyone gathered. If it was just the three of us in colder months, Gramps and I would play rummy, or Grandma and I would play Scrabble while she put up with me playing the radio loud when my favorite songs came on.. There were two bedrooms off the kitchen. The middle bedroom was often mine (I also liked to sleep on the living room couch so I could stay upe watching TV). I decorated it with scores of pictures of Mickey Mantle and other Yankees that I pasted on the walls. There was a secret (or maybe not so secret as Grandma was a sharp one) hole in the bedroom wall where two of my uncles, Kenny and Danny, hid their condoms. All the walls were wallpapered until the 1970s, when the kitchen, living room and a bedroom were paneled. Linoleum covered the floor, except the back bedroom which was painted concrete. Each room had a single rectangular window (the kitchen had two) that barely let in enough sunlight, so lights were always turned on in the house. Indoor plumbing did not make its appearance until I was 16. It could be stifling in the house in the summertime. Fans just did little more than waft warm air throughout the rooms. That is why Gramps and I loved rain storms. When they promised to break the heat (“Look at the upturned leaves, Buck. It’s gonna storm soon.”), we would climb the stairs and sit under the small overhang and just relish the rain. I still love to sit and watch and feel summer storms. I sometimes have imaginary conversations with Gramps. As you can understand most summer evenings at 20 S. McIlroy were spent outside. Gramps and I would go out first. Grandma would come out when she had finished the dishes. She might water her peonies (pronounced “pineys”) and sit with us. I usually had a baseball game on the radio and a book in my hand, but the three of us would just talk. Often they would reminisce. It is because of those stories that I became an historian. They taught me a love for the past. On really stifling nights Gramps might bring up a pillow and old sheet and sleep on the roof. I tried it once or twice with him, but I have always liked my comforts. At the back of the house was a mulberry tree whose fruit went uneaten but stained all it touched. In its notch, reachable by an easy climb, was an area that made a perfect cockpit. I shot down many a Messerschmidt 109 from there. When Gramps felt up to it we played catch in the yard. I cherished those times, though worried if I dropped a ball because he had played minor league baseball. But it was a silly worry. My Gramps never, ever said an unkind thing to me in my life. I was his boy. He and I had the sort of relationship I think he wished he had with his sons. But it is always easier with grandkids. By the time I was 10 or so I realized how others viewed my home. I knew they saw it as shoddy and felt either sorry or superior because we lived in that basement house at 20 S. McIlroy. As a teenager I sometimes felt the pangs of unease about what they thought, but then thought to hell with them. And now…..
That house was my home. A home made by those who lived there. My only real sadness about that house is Grandpa’s end. Though Mom and Grandma nursed him with incomparable compassion and love, his body wasted in his last few months. When I went in to talk to him I often closed my eyes. I wanted to remember my Gramps as he had always been in my life. He passed away in his bed, in his bedroom, in his home in August, 1977. A little over a year later his house had become as worn and wasted as he was at the end. Grandma was forced to move into a new house. A few years later the house at 20 S. McIlroy was leveled. Nothing of it remains to the passing eye. I started this essay with rather grandiose allusions to the place of place in history. 20 S. McIlroy means nothing to the world. But it does to me. I think of it often. I visit in every week in my dreams. It was, and is, home.